All UVC clarifiers have an automatic cleaning system, which ensures that the full output of the light is effectively used. Unique combination of UVC light and permanent magnets (except Bitron 9C/11C). The permanent magnet prevents the calcification of important pump and filter parts (except Bitron 9C/11C). The UVC light flocculates green algae thus facilitating the filtering process and destroying pathogens. 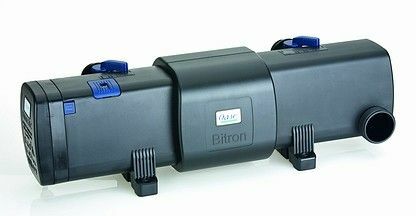 Bitron C devices are available in 8 variants (Bitron 9C/11C/18C/24C/36C/55C/72C/110C).